Serving up rare Champagnes, a cocktail featuring absinthe jelly and lobster rolls. Rare Champagnes, a cocktail featuring absinthe jelly and lobster rolls are all on the menu at Solera, a luxe new small bar that's just opened in Barangaroo. Working on the rather exotic drinks list is international hot shot Marian Beke, formerly of The Gibson, London. One example is the Apple of Louisiana, an original take on the Sazerac, with apple brandy, absinthe jelly and rock sugar. "[We're] serving up some of the city's best cocktails... pushing the cocktail-making boundaries," said Roman Kristek, who co-owns Solera with Scott Bayly and Ty Van Emden. Beke has also been busy sourcing Champagnes that you're unlikely to find anywhere else in Sydney. Look out for drops by Leclerc Briant, Jerome Dehours, Benoit Dehu and Ulysse Collin. Keeping them at the ideal temperature is the Kaelo, a high-tech cooling system that works at your table. Meanwhile, in the kitchen, chef Tony Gibson (Ruby and Rach, Astral) is whipping up lobster rolls — packed with half a lobster, citrus mayo, celery and chives — as well as Rueben sandwiches filled with Wagyu corned beef, swiss cheese, sauerkraut pickles and Russian dressing. For sharers, there's also a cheese and cold cut board. 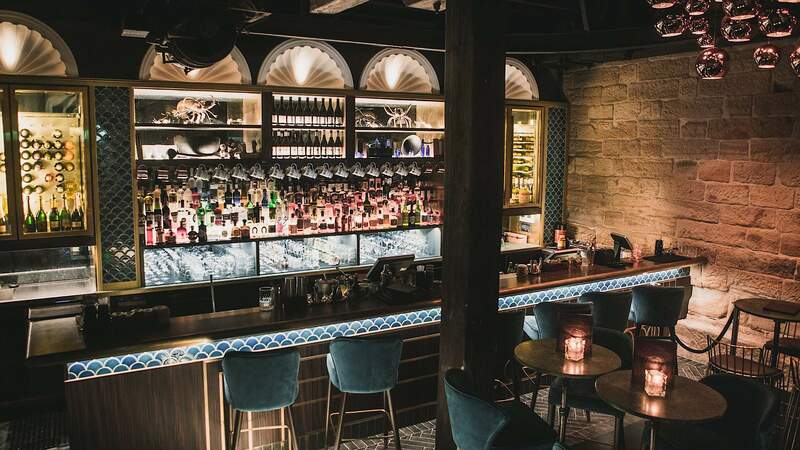 To match the decadent menus, designers Steel and Stitch (Lobo Plantation, Chula) have dotted the 100-seater, heritage-listed space with green velvet couches and splashes of marble. If you're keen to catch some sun, grab a table on the outdoor terrace. Solera Bar is on street level at 36 Hickson Road. Opening hours are 4pm till late, Monday to Saturday.